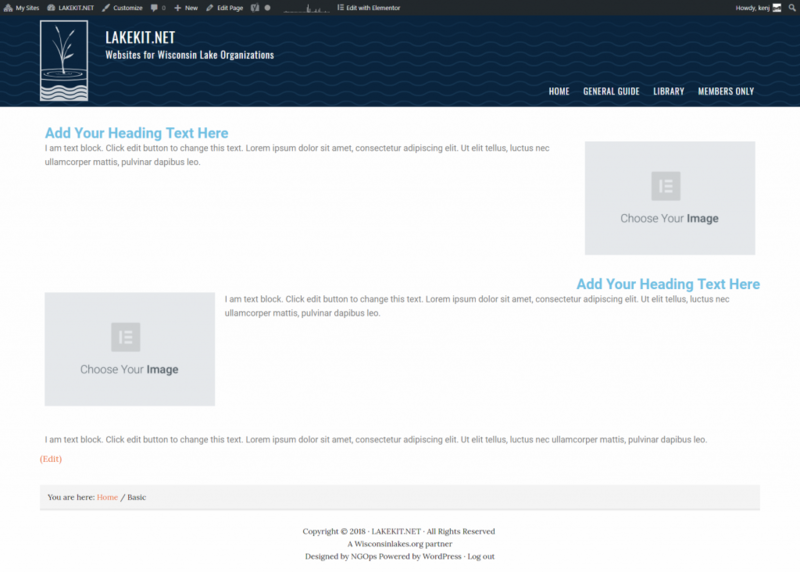 Template-Basic is the new basic Lakekit.net default template that will be similar to the current template-a but with a more user friendly design. This theme will be used in the lakekit.net network Wednesday morning workshop at the Wisconsin Lakes Partnership Convention. Template Basic is designed using a genesis theme framework and uses Elementor as the page and post drag and drop interface and content building interface. The interface is designed so a user does not need to know how to code a website and yet make each page or post look unique. Designed to be user friendly and low maintenance Template basic will allow novice WordPress site owner to be able to control their information from day one and experienced WordPress users to take their content to the next level. The major difference between the old Template-A system and the new Template Basic is that in Template-A the layout of content was tied to the theme so all content was predesignated to where it was displayed causing sites built with Template-A to all look alike. Template Basic brakes apart the theme from the content areas by using a content building plugin called Elementor. Elementor allows control over content by using a drag and drop container system used to control the layout of content on pages and post so each page or post can be made to look unique and individualistic. Even if the theme is changed the way that the content on your page or post is displayed won’t change.